but if i come back and get to live again on this earth…which i am not a total believer in, however since i don’t know 100% for sure, there is always that little inkling of ‘what if’ that gets me thinking. but if i reincarnate and i get a choice in the matter – i mean – do we have a sit down with God to discuss?… it is a toss up if i would rather be a beloved pet (Stan has it good) or an ice cream eating lady – which is a status that i could totally obtain right this instance…but my friends, i did not win the genetic game and well, my metabolism can not and will not ( i have tried) support a diet heavy in ice cream. there are pictures to prove it and a few pairs of jeans to remind me that ben and jerry are not my best friends. i don’t want to come back as an ant. ever watch honey i shrunk the kids? they have serious foes. i am always torn at which ice cream flavor is my favorite and honestly, i haven’t found one that when given no other choice i would turn it down. maybe rum raisin, i wasn’t crazy for it…but i still ate it. 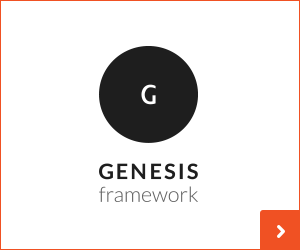 get my gist? but the basics – there are 3…chocolate, vanilla, strawberry. what is your favorite? as a kid, I always just assumed it was chocolate > strawberry > vanilla. with each bowl of neopolitan ice cream, i would eat vanilla first – get the least favorite out of the way – no one wants to end on a low note ( i do this with popcorn too, i eat the least buttered first and the grossly buttered last). as the vanilla disappeared and i was just waiting to hit the chocolate, i was always totally surprised at how down right scrumptious strawberry turned out to be. 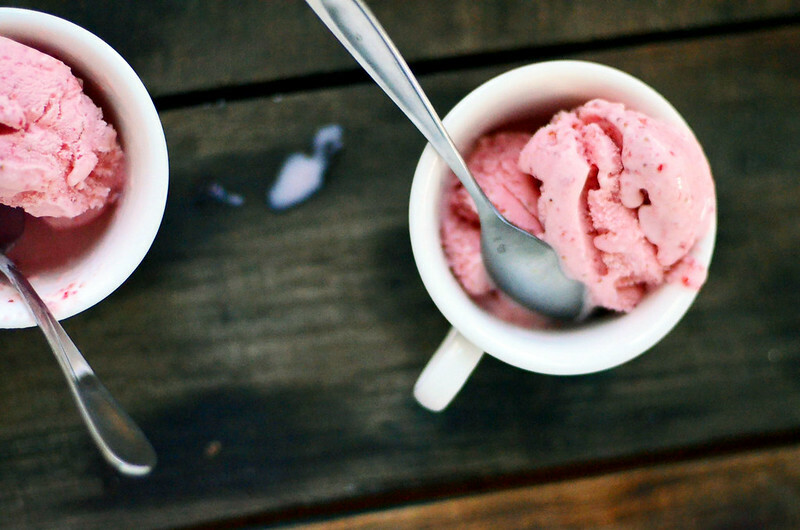 don’t get me wrong, chocolate never disappointed, and still doesn’t…but there is just something about strawberry ice cream that brings a slow smile to my face that chocolate just can’t do. so now, i believe my good, better, best bit is more like chocolate = strawberry >vanilla. am i the only one that lists favorites within a category? i like to know where i stand. especially when it comes to ice cream. 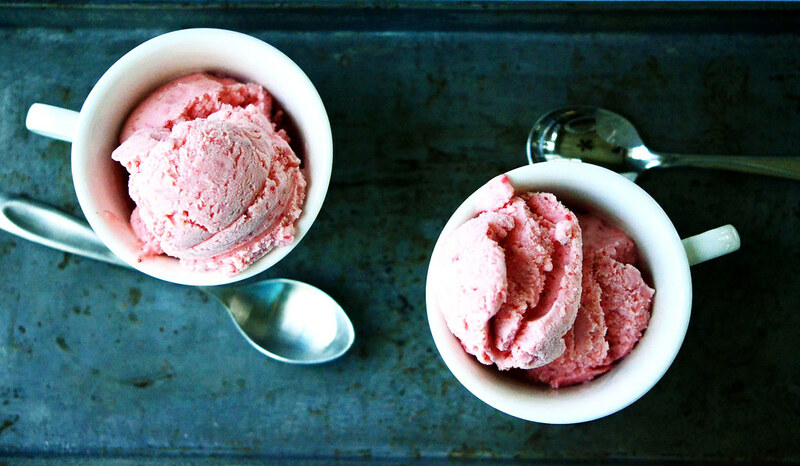 homemade ice cream takes a bit of thinking ahead. which can be difficult with cravings. unless you crave ice cream all the time. this bit is eggless…so i think it is considered an american ice cream. which is fitting since i am in ohio, smack dab in the middle. we are gonna dissolve sugar and honey in heavy cream. sweetened cream. and then we will sideline it in the fridge overnight. gah, the waiting is the worst! strawberries are hulled and quartered and sugar is added. let these chill out in the fridge too…they can keep the sweet cream company. it is lonely in that dark fridge. the next morning…we are gonna have this set up. and your pajamas will still be on … and breakfast is half eaten on the counter. coffee is just out of camera view. ice cream is a first thing in the morning reason to get out of bed activity. 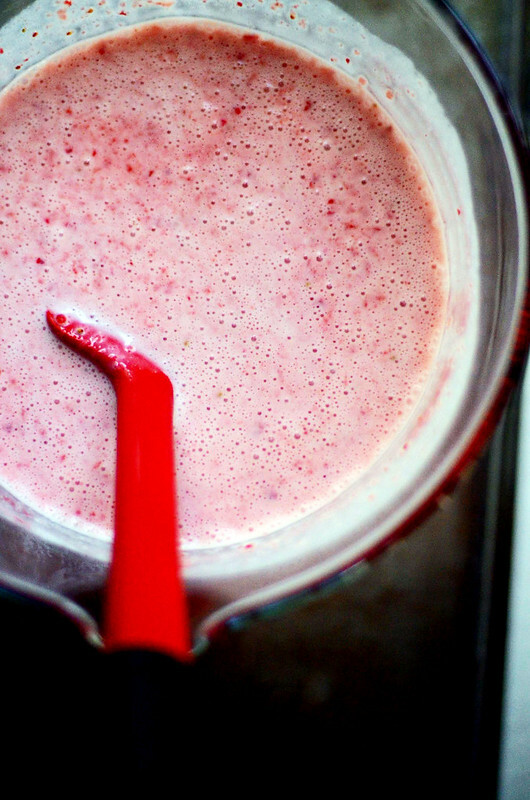 those strawberries are gonna get a whirr in the blender – pulse until your chunkiness preference is reached. 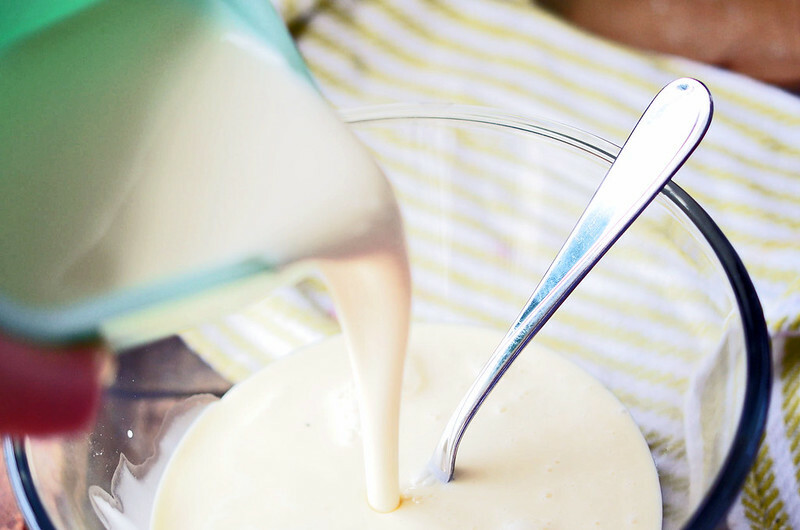 cold buttermilk is poured into the sweetened cream. as is the strawberry puree. 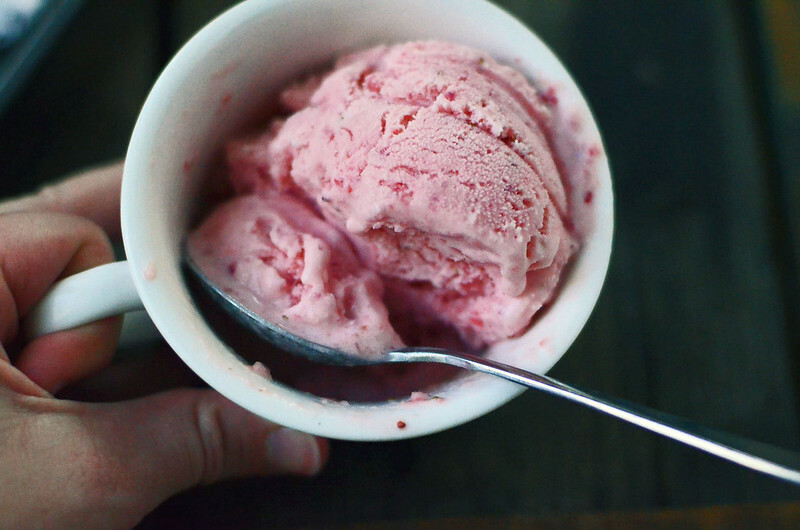 i add bourbon here…just a tablespoon…keeps the ice cream from freezing solid, allowing you to scoop with ease. vodka would do the trick as well. or maybe gin. 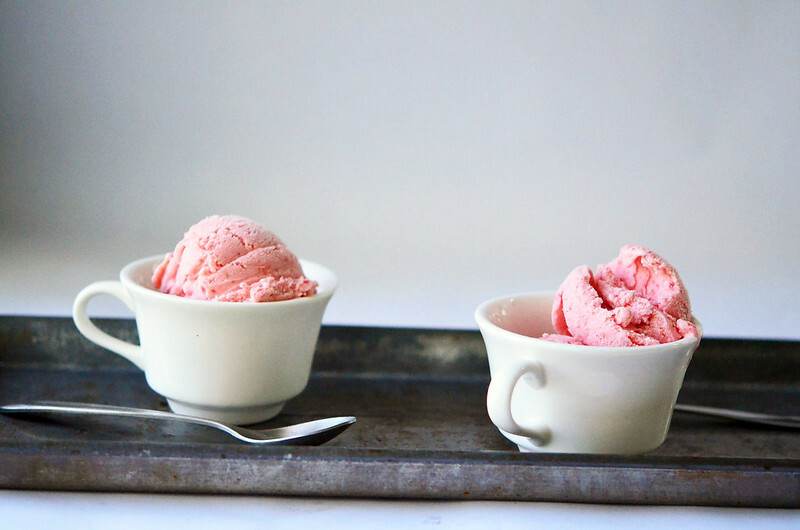 it is like strawberry milk meets melted strawberry milkshake. but somehow better. i considered pouring myself a glass … i opted for just a few slurpy tablespoonfuls. most of which ended up on the front of my pajamas. churn until frozen. this is totally up to your ice cream maker. i use this one and love it. after 15-20 minutes, i had soft serve and after a few hours in the freezer, I had hard scoop. the machine is a bit loud, but otherwise it doses the trick – again, you have to think ahead and make sure that bowl is good and frozen! but all that thinking ahead pays off in the end! i think it has to do with the handle. or the memories. coffee mugs = versatile vessels. 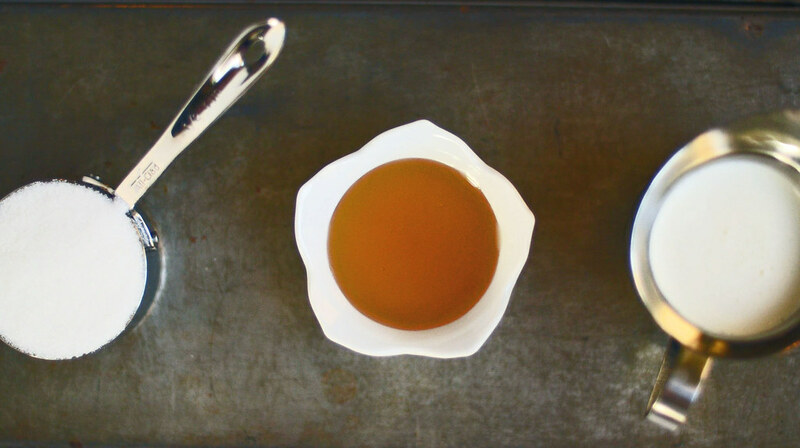 In a small saucepan, combine heavy cream, ⅓ cup sugar, and honey. Place over medium-low heat and stir until sugar and honey dissolves. Test this by rubbing cream between fingers. Sugar is dissolved when you no longer feel grittiness. Pour into a container with a lid and store in fridge until chilled through - at least 6 to 8 hours. 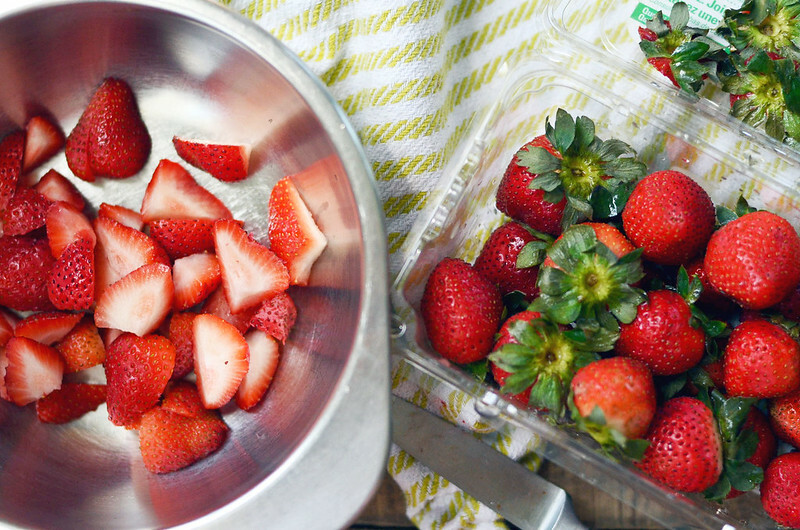 In a medium sized bowl, combine strawberries and remaining 2 tablespoonfuls of sugar and toss to combine. Let these sit in fridge for at least 1 hour or up to 24 hours. 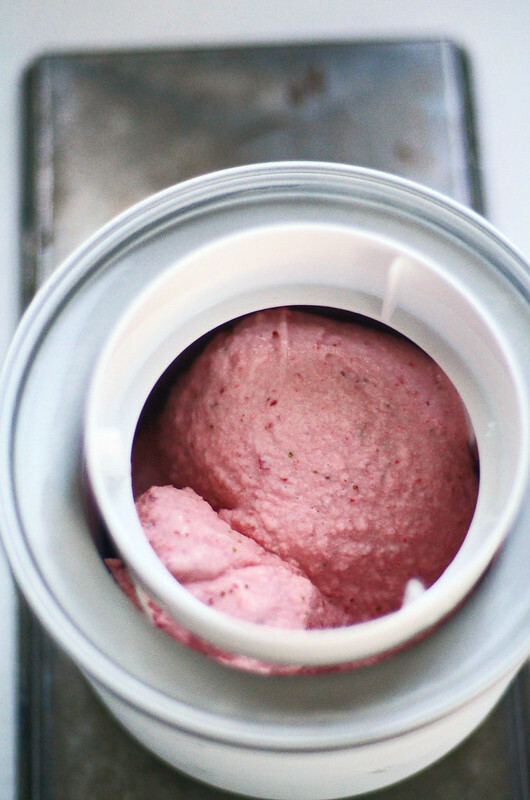 Right before you are ready to churn ice cream, transfer strawberries to blender and pulse strawberries until your preferred chunkiness is reached. I don't like chunks - I pureed. 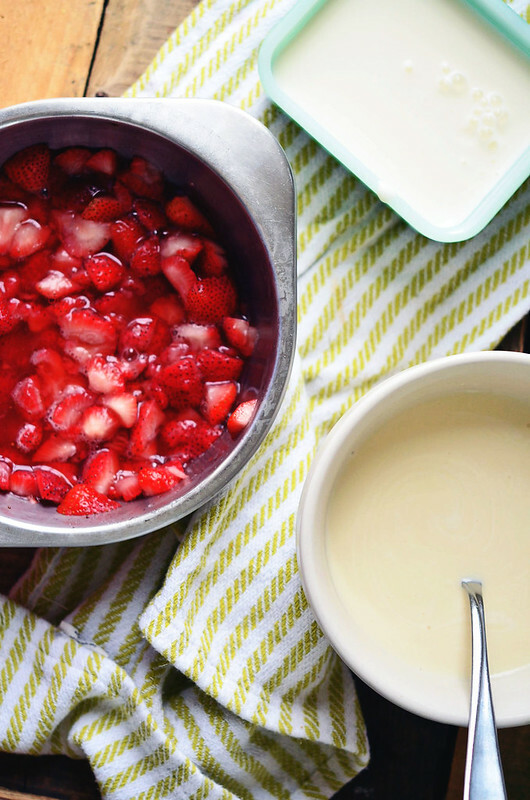 Once everything is chilled thoroughly - in a large mixing bowl, combine sweetened cream, cold buttermilk, pureed strawberries, bourbon, and a pinch of salt. With a large spoon, stir thoroughly. Transfer mixture to your ice cream maker and churn according to manufactures directions. When done churning, transfer ice cream to freezer and freeze for several hours (at least 3 or 4) until hardened. I like to use a loaf pan lined with parchment paper to store my ice cream in the freezer.